The 13th. 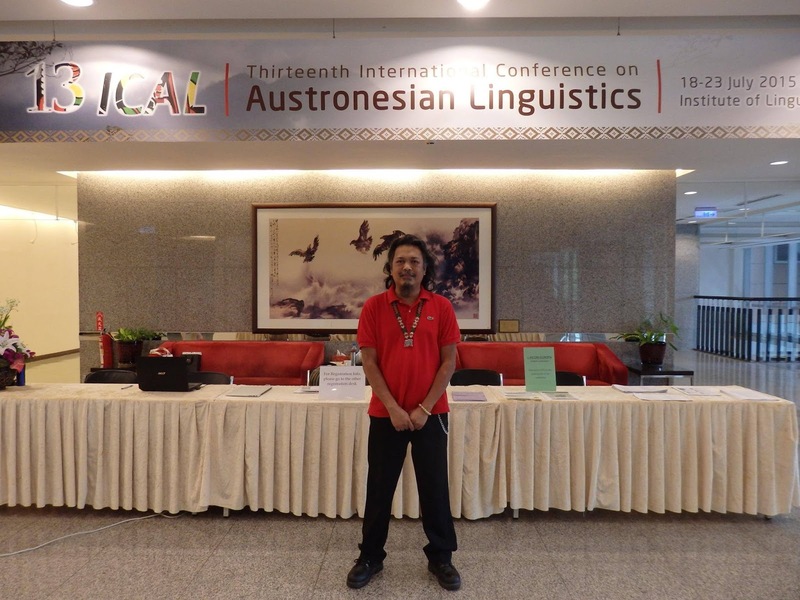 ICAL (International Conference on Austronesian Linguistics), was held at the Institute of Linguistics in Academia Sinica, Taipei, Taiwan, last July, 18 to 23, 2015. With the help and support of our fundraising donors, generous people, friends, and family, Mike Pangilinan and I were able to present our papers at ICAL last year. Mike and I greatly appreciate their help. We and our papers were well received and praised by international linguistic scholars and professionals who were in attendance. Our presentations were on point and they went smoothly. I'm pretty happy with the reception and validation of my work by our peers. Mike Pangilinan, as our panel leader, introduces me to the audience before my presentation. I gained a lot of knowledge and experience from this conference. Attending and absorbing most of the presentations that I can catch every day of the event, I've learned much about various studies, methodologies, histories, practices, and projects relating to various Austronesian and Southeast Asian languages. All these knowledge can be applied to further continue our own efforts with Philippine scripts. I also have met and spent time with the top international Austronesian & SEA language scholars and professionals during the event. Conversations with these great minds were extremely entertaining and enlightening. I got reacquainted with awesome people I've met previously in Tokyo. And I met new and amazing people and made friends with them in this venue. Gained new important connections and expanded our network, finally met folks from SIL too. 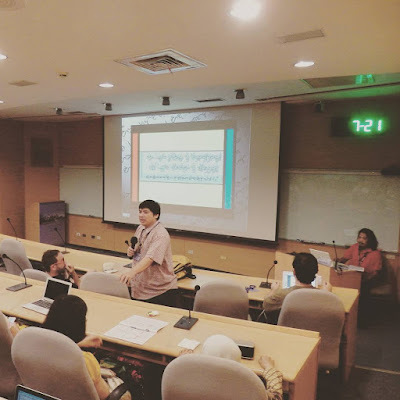 There were a couple of acquaintances from social networks whose work on Philippine languages I admire and follow for years; I met them in person for the first time at the conference. It was a bit surreal when we talked as if we've known each other for a long time. 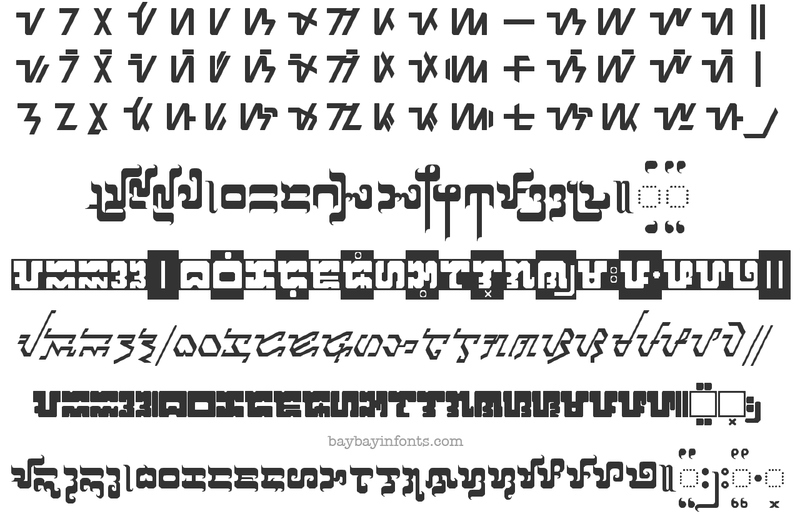 Mangyan, Kulitan, and Baybayin fonts created for our 13-ICAL fundraising. It took me a while to recover from this trip (my health went on a decline the weeks and months following my return from Taiwan) and I was meaning to write about it earlier last year. Now, the time has come for another linguistic conference and I need to continue moving on to the next level. It's my cleaner and more standardized version of the Doctrina Christiana typeface. I released it earlier without any fanfare. But I guess I should stop procrastinating this new year as a resolution (fingers crossed), after all, I still haven't released a report from last year's ICAL conference and another one is soon to be due this year. The main and immediately noticeable difference is the addition of the set of alternative glyphs from my modern set and proposed reform. 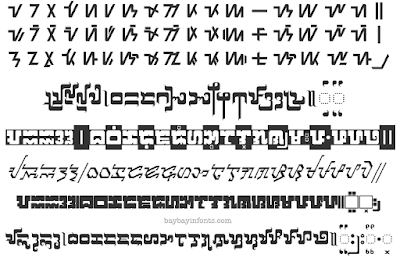 I added the modern RA and the kawi based JA, Mangyan pamudpod, x-kudlit, anusvāra, visarga, e/o kudlits, pallawa & padalaw-a marks, and other syllable-doubling marks; assigning them to the appropriate keys. What's not immediately noticeable until you use the font is the different aesthetic feel of the typeface. My many tweaks that resulted on character element's uniformity (while keeping with the basic shapes of the old typeface) gives this font a definite modern feel, a lively touch, and youthful appeal. For the Modern Doctrina font, I sampled and compared each and every character from the whole Doctrina Christiana and determined the recurring elements, forms, and details of each letter. I evaluated character rotations, print defects, shape & size anomalies, and numerous features. In the end, I developed a clean and unified standard for this new font version but retained the spirit of the old typeface. [EULA] © All rights reserved, Nordenx Baybayin Modern Fonts are copyright of their typeface designer & creator Norman de los Santos. Free for personal and non-commercial use only. Please contact me at nordenx@gmail.com or nordenx@yahoo.com for any inquiries about commercial use and licensing for branding, printing, publications, and/or other electronic applications.